PACQUIAO AT OXFORD: "DREAMS DO COME TRUE"
With those words, Filipino boxing legend and Senator Manny Pacquiao captivated the hearts of Londons’ Oxford University students, members of the Oxford Union Debating Society and their guests when he spoke before them on Monday (Tuesday in Manila). 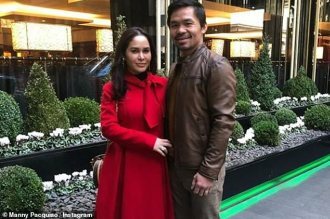 “That is Manny Pacquiao’s story so I ask you -- all of you -- to never lose faith in what you can do as a human being, belief in the loyalty of family, and belief in the Almighty,” the eight-division boxing champion said in his message. 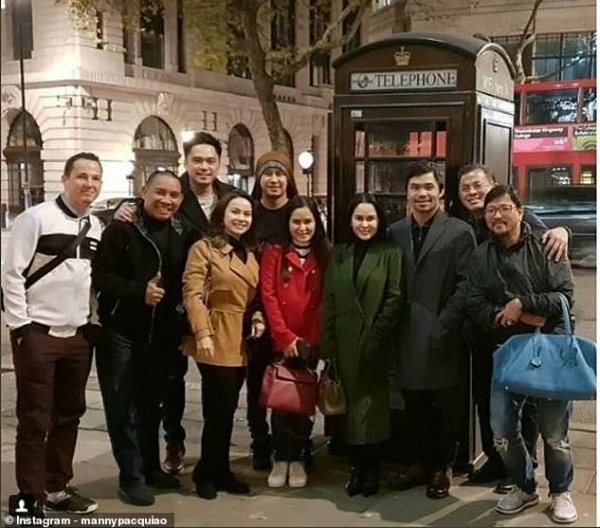 Manny Pacquiao (3rd from left) and wife Jinkee (4th from left) with their entourage in London. “It is a matter of record that I only had traditional formal schooling until Secondary School, Grade 12, the Pacman added. “It was only recently that I reached University level through the alternative education program. We were dirt poor. I had to work since the age of five, to help my mother feed my three siblings and me. Many days, I was lucky to have one full meal. “At night when I could not sleep because of the cold, I would read the labels on the carton boxes that served as my bed on the street pavement. The movements of the clouds, the tint of the horizon, and the clarity of the stars taught me when morning was about to come," he continued. Shifting to his role as a senator, Pacqiuao said he participate in debates that result in the passage of legislation which determine the course of our country’s history and, indirectly, the world’s. "But how are my struggles of any value to the Filipinos? It cannot feed or clothe all of them. No matter how much I give financially, hundreds of thousands more remain wanting." Pacquiao then reminisced his experience when he visited Tacloban in 2013, in the aftermath of Category 5 super typhoon that ravaged ravaged the city. "Those boys, who had nothing left, gave me hope,” he averred. “These and other experiences like this motivated me to answer the call it is a glorified blow-up of what millions of Filipinos live through on a day to day basis -- the hardships, the challenges, the back-breaking, hope-extinguishing despair. Yet, through the ashes of destruction, the Filipino always manages to rise up and fight another day," Pacquiao said.